Cooperative skill challenges in colorful detail! Set of six 12" x 18" posters. Each has a picture of kids doing the challenge. Plus a brief explanation of what's required. Perfect at stations and skill introductions. 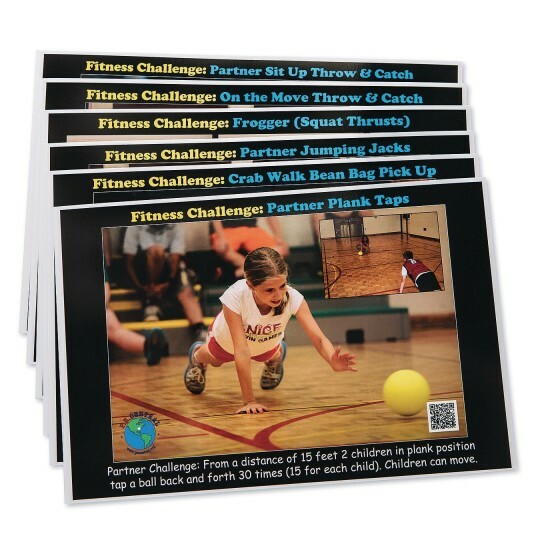 Six colorful 12" x 18" posters depict and explain each of the Cooperative Fitness Challenge tasks. Each poster features a picture of children doing the challenge, a brief explanation of the challenge, plus a QR code that can be scanned with a smart phone or tablet that takes you to a description and video of the challenge. Great for stations. Posters are made out of 80-lb. coated white bond paper. The posters ship flat. Posters are not laminated, but can be laminated by the customer for added durability. 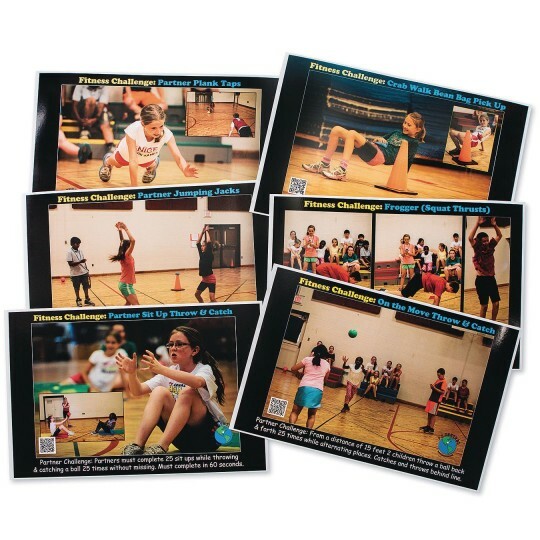 Teachers love PE Central's New Fitness Challenges. Check out this review! "I finally got to see the activities in action. They are challenging! The parents were encouraging the students, my [instructors] had a blast trying out the different stations and working with the kids, and many of the students passed a challenge or two. What fun!" Laminate and set up in a station. these six stations will help your kids learn to cooperate while getting fit. these are awesome!